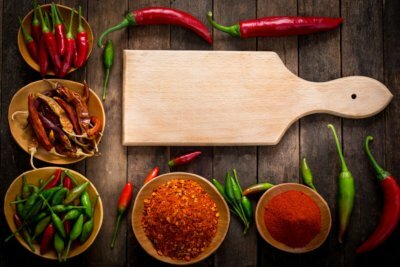 It turns out that spicing up your life with hot chili peppers, cayenne, and other capsaicin-containing seasonings could help prevent and possibly cure type 2 diabetes. Many Americans are unaware of the diabetes crisis happening in this country today. It is estimated that by the year 2050, one-third of all adults in the United States will be diagnosed with diabetes. These are some scary statistics, so I am relieved to see some progress being made in the fight against this horrible disease. The animal study outlined in the magazine showed that, when eaten, chili peppers interact with a pain receptor in the stomach and seem to prevent inflammation in the gut. The answer lies in inflammation and how the heat of capsaicin, the active compound in chili peppers, cools those flames. Inflammation is known to play an important role in the development of obesity, insulin resistance, and diabetes. During this study, mice were actually cured of diabetes through a diet of chili pepper extract. Researchers fed the mice capsaicin, and found that the mice experienced lower levels of inflammation in their gut, leading to the reversal of diabetes. At a molecular level, the scientists saw that the capsaicin was binding to a receptor found on specialized cells throughout the digestive tract. When the compound binds to these receptors, it produces a chemical called anandamide. And it’s similar to the cannabinoid in marijuana that essentially tells the immune system to calm down. This process then causes a chain reaction that leads to the release of a macrophage (an immune cell) that subdues inflammation. This new evidence also shows that capsaicin makes the cells more sensitive to insulin and improves the balance between blood sugar and insulin in the body. In fact, some diabetes drugs are anti-inflammatory, which drops the blood sugar level as inflammation decreases. So, chili peppers may just be a more natural way of decreasing the inflammation of the gut—and dodging insulin resistance, and type 2 diabetes. You can start by seasoning your food with chili pepper or cayenne. Adding a total of three tablespoons of chili pepper to meals every day can even out insulin and blood sugar spikes after meals. Try adding chili powder to peanuts for a spicy treat, or make a popular Mexican snack of cucumbers with lime and chili powder. Why not add some heat to your pasta sauce and make it arrabiata, or make your scrambled eggs spicy? There are so many easy ways to incorporate the spice into your daily meals. As with all natural alternatives, check with your doctor before starting treatment and make sure it is the best possible solution to manage your health. Diabetes is a serious condition. It’s important that you take your prescribed medication along with adding cayenne pepper, chili pepper, or any other seasoning to your diet. “Spice up your life” has a whole new meaning with these research findings! To make this treatment super simple, start each day by pre-measuring three tablespoons of your seasoning of choice. Use it to add to your meals and snacks throughout the day. Downey, M., “Chili Pepper Compound May Help Cure Colitis and Diabetes,” Vitality magazine, June 2017; http://vitalitymagazine.com/article/news-briefs-june-2017, last accessed August 3, 2017.
http://www.livestrong.com/article/502853-diabetes-cayenne-pepper/, last accessed August 3, 2017.
http://www.naturalnews.com/045460_capsaicin_diabetes_obesity.html, last accessed August 3, 2017.